Have you heard of the fantastic emailing list called Freecycle? If not then you are probably really missing out. The idea is that you subscribe to the list and offer anything that you don't want/can't sell/have cluttering up you home to the list. Anyone who is interested can then send you a quick message and ask to have it. This way unwanted items stay out of landfill and a large group of people get to share what they no longer need. My husband and I have freecycled a lot of our unwanted stuff (mostly after house moves) and it was great to know that these items would go on to other homes who wanted and would use them. But today it was my turn to take what someone else was throwing out and give it a good home. 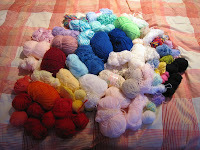 I hit the big time with this huge stash of beautiful wool. Just look at it... that rainbow of left over skeins of wool (so many exciting new colours!) and then those two massive piles of bright red and lovely purple wool. I think I shall be smiling about this for such a long time!